The recipe calls for two pounds of fruit. While I was in Whole Foods picking up some ingredients, I thought I remembered it calling for three pounds of fruit. Then I figured I could tell by feel what three pounds felt like, so I loaded in about 20 small peaches into my basket. Did you know that I actually bought six pounds of peaches?! I knew they wouldn’t go to waste, even if they all didn’t fit in this crisp, but still, six pounds y’all. By the end of the day, I used about four pounds of peaces in my crisp and boy was it good! Lesson learned: use the scales in the produce section, that’s what they’re there for. 1. Place the chopped fruit in a medium-sized bowl. 2. In a separate small bowl whisk together the 1/4 cup sugar and the cornstarch. Sprinkle over the fruit, toss gently until completely covered. 4. Combine the oats, flour, sugar, and cinnamon together in a medium bowl. Stir in the butter, and then the yogurt and mix until everything comes together in a dough-like texture. 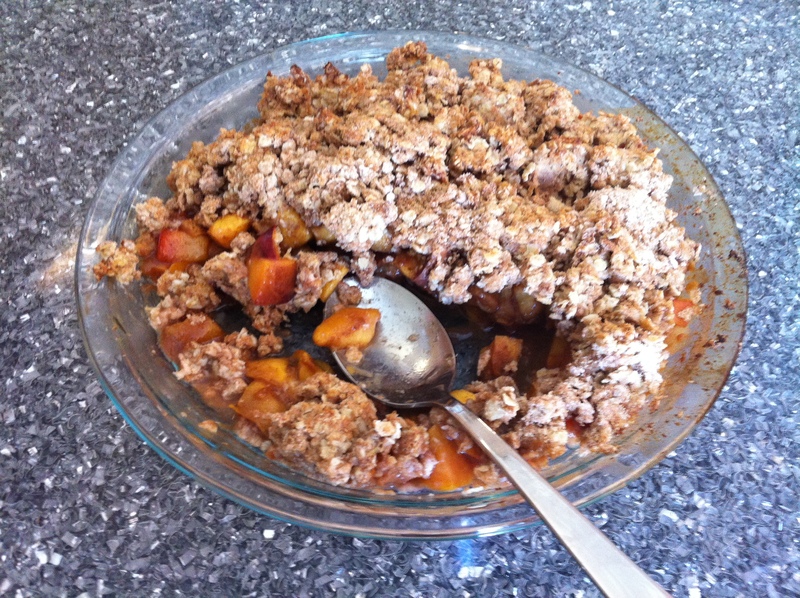 Sprinkle the crumble evenly over the peach mixture. 5. Place the baking dish in the oven, middle rack, and bake for about 20-25 minutes, or until the topping is golden. Optional: sprinkle a bit more sugar on top as it comes out of the oven. Voila! A delicious summer treat! I love a good crisp. It feels like a “healthy” dessert!